Danny lives in the tiny village of Brampton, where not much happens. One night after a storm, Danny thinks that he hears a low humming and sees a light out of his window, but he might just have imagined that. Then his strange Uncle Colin appears asking about noises and lights, along with a rather odd army captain who is snooping around and appears to be speaking to trees on the common. This is maybe the weirdest thing that has ever happened in Brampton, and Danny and his new friend, Nat, want to uncover the mystery. When they discover something shimmering in a patch of nettles in the clearing at the bottom of Danny’s yard, things really start to get exciting! The plot of Danny Chaucer’s Flying Saucer was simple, logical, and entertaining. Danny and Nat have an amazing experience with BOB – Brain On Board, the artificial mind inside the flying saucer, while thwarting the efforts of evil Captain Frost, also known as Frosty-Knickers, and avoiding detection from Danny’s parents and uncle. The story flowed nicely, and I finished reading it quickly. The characters in this story were well developed. It was easy to imagine the petite Nat speeding along the street, or Danny trying to trick Uncle Colin. They made a good team, especially when working together against the school bullies or Captain Frost. I liked the characters of Nat and Danny, but BOB really made the story for me. BOB was full of spunky character that made me laugh. I’ve never come across a computer that speaks with a “cockney twang” before, nor one that spends so much time boasting of its magnificent abilities! 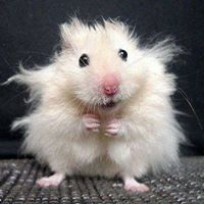 Of course, if I had abilities like BOB, I’d probably want to share them with anyone who would listen too. I liked that BOB was as keen to inconvenience and impede Captain Frost as Danny and Nat. Captain Frost was the perfect adversary, and I disliked her immediately. As soon as she entered the story, I wanted her to fail in whatever her plans might be! 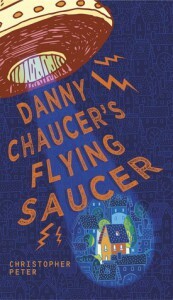 Danny Chaucer’s Flying Saucer got the tick of approval from my third grader! She thought it was amusing, and exciting. The subject and delivery of the story was just right for her, and she said she would read it again along with any future Danny Chaucer books. There were a couple of references to things I doubt my third grader or her friends would know about, such as Russell Brand, and the TV show Downton Abbey. However, these references weren’t particularly important to the flow of the story, and my eight year old just skipped over them and kept reading. This out of this world adventure is suitable for middle and upper primary school students. I believe Danny Chaucer’s Flying Saucer is the first in a new series of funny adventures with Danny, Nat and BOB. I am looking forward to the next installment. *I received this book as a digital copy from the author, who asked me for an honest review of this book. I did not receive any other remuneration, and the review is composed entirely of my own opinions and that of my daughter.